A HUGE, STONE-PAVERED POOL & SPA LANAI WITH STACKED-STONE BAR & GRILL awaits you in this privacy-fenced yard with no neighbor on one side that extends to a cul-de-sac & woodsy conservation view! 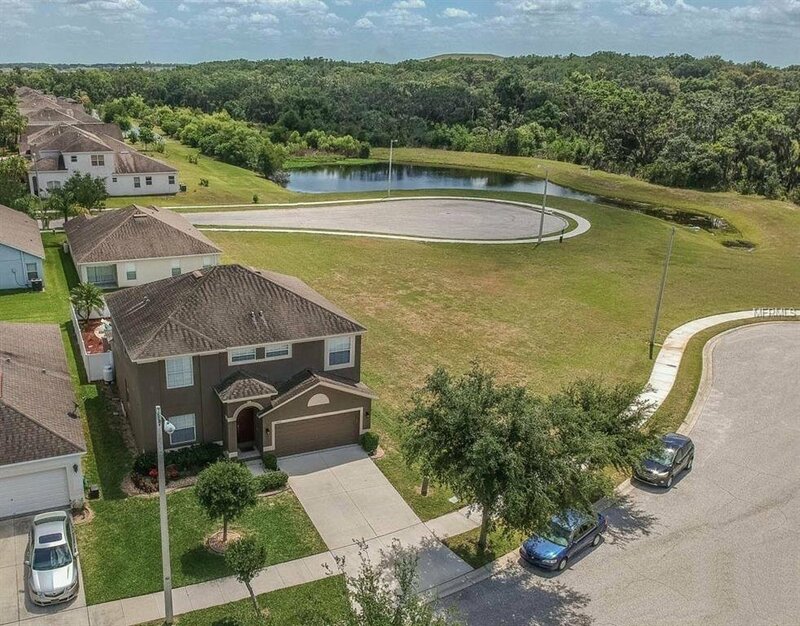 It's in Shady Creek Preserve, a neighborhood with low HOA & no CDD fees in south Riverview near the new regional hospital, retail centers, restaurants, recreation spots & easy routes to Tampa, Gulf beaches, etc. You get 2,440 square feet in a 2-story design with 4 big bedrooms, 2 baths & a laundry upstairs, then formal living & dining rooms, a spacious family room, island kitchen with breakfast area & a convenient lavatory downstairs. Sliders from the family room & kitchen open to that gorgeous lanai, which puts the built-in bar & grill beside a seating area under the roof line for late-afternoon shade & all-weather enjoyment. Expensive fencing of 6-foot white vinyl provides privacy, although there's no neighbor at all on the south side of the home -- just a green expanse along the cul-de-sac & a tree-lined pond with a dog-walking trail. Improvements & extras include fresh paint inside & out, a new propane tank for the spa heater, new carpet in 3 rooms, impressive marble & hardwood floors in others, kitchen & baths with granite & wood, stainless-steel appliances, upper & lower cabinet lights, tiled backsplashes & more. Here's your chance to be the second owner of this first-rate home! Listing courtesy of RE/MAX BAY TO BAY. Selling Office: KELLER WILLIAMS TAMPA CENTRAL.